TORONTO, April 5, 2019 /CNW/ - The Holiday Inn Express® brand, part of IHG Hotels & Resorts (IHG®), knows that whether its guests are hockey players, sports analysts or super fans, a hot and fresh breakfast is the key to fueling up before a big game. 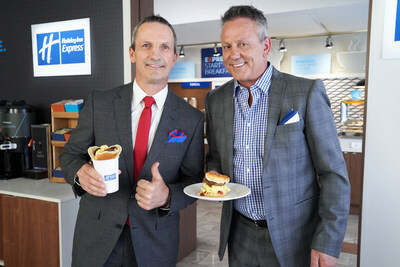 To celebrate the rollout of the new Express Start® Breakfast Bar in Canada, the brand challenged two Canadian champions and hockey-rivals—Doug Gilmour and Guy Carbonneau—to create the ultimate breakfast creation in the READIEST Breakfast Challenge Canada. Hockey analyst and former player Mike Johnson acted as referee and sampled the competing creations from the judge's stand. VIDEO: READIEST Breakfast Challenge Canada: Hockey Legends Doug Gilmour and Guy Carbonneau go head-to-head in the Holiday Inn Express READIEST Breakfast Challenge to create the ultimate breakfast combo. 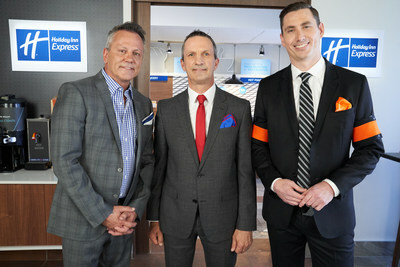 VIDEO: Hockey Legends Doug Gilmour and Guy Carbonneau compete in the Holiday Inn Express READIEST Breakfast Challenge Canada hosted by Mike Johnson. Guy Carbonneau, Montreal hockey great and READIEST Breakfast Challenge Canada Winner, said: "With one of the oldest rivalries in hockey history, I knew I had to bring my A game. So, I packed all sorts of breakfast greatness into The Power Play Pancake Cup. It feels great to be the winner of the Holiday Inn Express READIEST Breakfast Challenge Canada." For travelers on the go, Holiday Inn Express offers the basics done brilliantly – a great night's sleep with EXPRESS Recharge, free high-speed Internet, and the Express Start® breakfast included – to help guests feel more than ready for their day. As the fastest growing brand for the InterContinental Hotels Group® (IHG®), Holiday Inn Express hotels can be found around the world, offering a simple, smart travel experience for both business and leisure travelers. In 2017, Holiday Inn Express introduced the updated Express Start breakfast featuring more than 30 complimentary hot and fresh items to choose from, including the signature one-touch pancake machine. For more information, visit www.holidayinnexpress.com, and connect with us on Facebook www.facebook.com/holidayinnexpress, Twitter www.twitter.com/HIExpress, and Instagram www.instagram.com/holidayinnexpress.